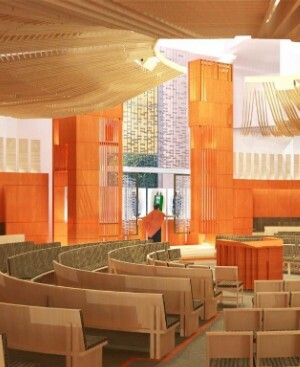 As we begin a new chapter in Temple Beth Am's storied history, with the opening of our new Sanctuary, we invite you to participate in one of the most unique elements of our re-imagined sacred space.Our architects have designed 54 original and distinct illuminated Parsha Panels which will surround our congregation with a glowing and exquisitely artistic expression of Torah. Each unique panel is made of art glass etched with words and patterns that carry subtle layers of meaning distilled from the Torah portions themselves, as well as numerous ancient and contemporary parsha commentaries. We hope each will be accessible to readers and viewers in numerous ways, such that the meanings of the panels will both be open to interpretation and discovery and also prompt questions (a very Jewish disposition), just as the Torah portions themselves challenge us to do. We proudly, and confidently, believe that these 54 panels are some of the most inventive and stunning pieces of Jewish art you will come across in your lifetimes. And we have them as communal treasures, within our new sanctuary. A sample panel is currently on display in the lobby. We invite you to dedicate a parsha panel in honor or in memory of a loved one, to celebrate a life-cycle event or commemorate your favorite Shabbat or other special occasion. Parsha Panel dedications are $10,000 each. Between now and June 1, there is no limit to the number of dedications accepted for each parsha. In June, our architects will complete the design for donor recognition for this project based on the number of dedications; after June 1, there will be limited opportunities and spaces on the donor wall to dedicate a particular parsha. If a particular parsha is meaningful to you as your own, or your child’s Bar/Bat Mitzvah parsha, we strongly encourage you dedicate it before June 1! CLICK HERE to look up a specific parsha by date.